OK, let’s set the stage for this. It’s the fall of 2008, the first semester of my senior year of high school. It was an interesting time, for sure – the markets had crashed, a landmark Presidential election was on its way, the Yankees had missed the playoffs for the first time in 15 years. I was applying to college. Sarah Palin was making headlines. People were first starting to use this Twitter thing. Anyway, that semester I took a class called Participation in Government, where, among other things, we created our own political party*, listened to NWA, and watched Wall-e. It was a great class. A simpler time. So many things were happening in government that it was really a perfect time to be in a class like that. *It was a group project, and our party was called the Third Term Party. Our platform called for the repeal of the 22nd Amendment so that George Bush could continue his Presidency. We actually created a cabinet and a website and a video and really went to unnecessary lengths for this project. I guess we had the time to kill. The remnants of the website can be seen here, on the off chance you are interested. One assignment stood out. We were tasked with writing a letter to a person of note – a politician, an athlete, someone who we admired or loathed or just wanted to write to. A lot of people wrote to Obama, or Hillary Clinton, or someone who was never going to respond. 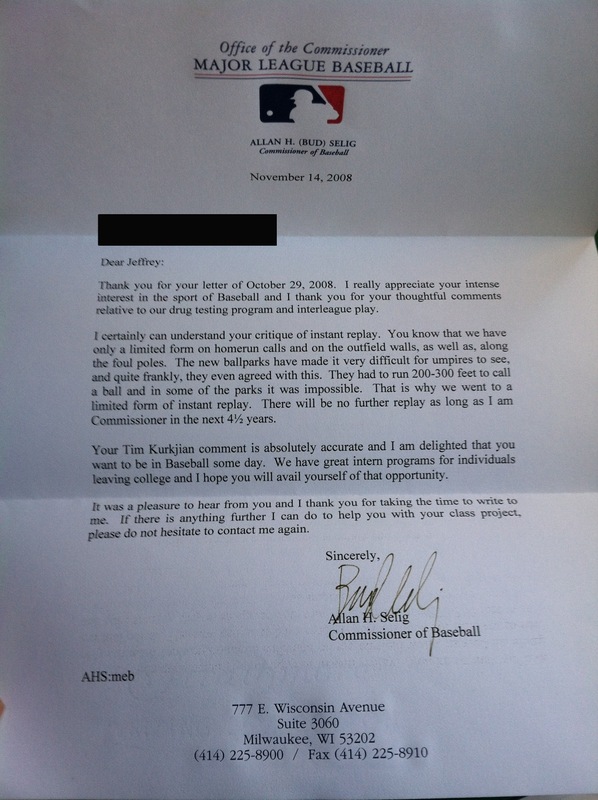 I wrote to Bud Selig. And, honestly, I never expected a response. My letter wasn’t particularly interesting or thoughtful. I wrote about what I liked, what I didn’t like, things he could improve. I said I wanted to work in baseball one day. I focused much of the letter on instant replay – this was around the time when baseball first instituted replay for home run calls. I didn’t like it, and I wanted him to know. About a month later, he wrote back. There are a few interesting things about this letter. There are some misplaced commas. He capitalizes Baseball. But, for the purposes of this post, here is what stands out: There will be no further replay as long as I am Commissioner in the next 4 1/2 years. Well, here we are 5 1/2 years later, and Selig is still the commissioner. He is 80 years old. He had planned to retire after the 2012 season, but obviously that didn’t happen. And, you probably know this, but he recently agreed to expand instant replay for the 2014 season. “There isn’t one play or one instance that changed my mind. It has just happened over time. I know we’re doing the right thing,” said the commissioner. Here’s the gist of it: a manager now has at least one “challenge.” If he gets the challenge right, he gets another one. If he doesn’t, he can’t use another one. But, even if the manager is out of “challenges,” the umpires can still decide to review a call after the seventh inning. It’s not so different from the NFL, where head coaches get two challenges, and if both are right, they get a third. All plays are reviewable in the final two minutes of the second and fourth quarters. Objectively, expanded replay is a good thing – there will be less stress on umpires, more calls will be correct, and almost everyone (players, owners, managers, umpires, fans) wanted it. The game is taking a huge stride into the 21st century, and it will lead to fewer arguments and fewer controversial calls. In terms of fairness, the game is better. And now I will probably share an unpopular opinion – I still don’t like it. I fully admit that this is a dumb position. It’s archaic, it’s impractical, it doesn’t make sense when it is so easy to reverse a call when a zillion cameras are watching every play. This isn’t really about the human element or about possible delays in the action as umpires review several close calls late in the game. No, I don’t think expanded replay will make the game longer (though it could). Baseball is about entertainment. And, well, I like arguments. I like when managers storm out the dugout, get ejected, kick dirt, and put on a show. You don’t see that in other sports because there are penalties – if an NFL coach threw down his headset and stormed onto the field, the team would get a 15 yard penalty. It happens, but not often. Same thing in the NBA – if a coach argues furiously, they get a technical foul. In baseball, you argue, you get ejected, but you can pretty much do whatever you want and not hurt the team. When Jim Joyce blew a call that ruined Armando Galarraga’s perfect game, it was great theater. Really, it was. It was unfortunate, yes, but it was real, it was better than any other reality show on television. Joyce admitted his mistake and apologized profusely, which is something that few umpires would be able to do. There was a lot of anger that day, but Galarraga took it all in stride, he laughed about it, and the following day he delivered the lineup card and hugged Jim Joyce before the game started. How great is that? There will still be arguments. Balls and strikes are not reviewable. Umpires don’t have to review plays after the seventh inning, even if a manager requests it. But I think the game has lost something, it has lost some of that raw emotion that comes when umpires miss calls (and, in the grand scheme of things, it doesn’t happen that often). Yes, this is a silly position for me to take. I’m a pragmatic person, and expanded replay is a pragmatic move. Baseball is dealing with this issue sensibly and realistically. But, rational thinking does not leave much room for emotions. I can’t really control the way I feel about it, even if the pros of instant replay outway the cons. And, this is another silly thought, but I really believed Selig meant it when he wrote that there would be no further replay. He wrote that line so decisively. There will be no further replay as long as I am Commissioner in the next 4 1/2 years. Well, here we are in 2014, and there is expanded replay. I don’t like it. Anyway, feel free to tell me how wrong I am.